Benefit Fundraiser for CCC organizations! Location: Hwy 72 & Skyline Dr. WINNER of the $50 HOME DEPOT Gift Card is….Linda Martin! BUY to Benefit our local organizations with this Plant a Tree for Me fundraiser. Limber Pine, White Fir, Quaking Aspen, & Wildflower selection. Buy $20 worth and get a free tree cage! 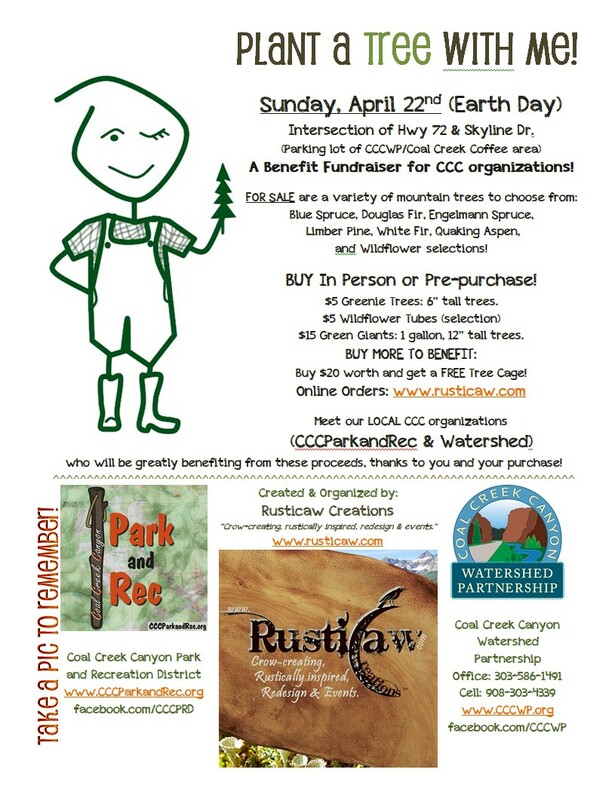 Rusticaw Creations is helping Coal Creek Canyon Park and Recreation District and Watershed Partnership raise funds for their mission! Rusticaw has created and organized this fundraiser while donating 90% of its profits to these organizations, along with us donating our 10% of profits towards the costs to do this event so they won’t have to pay a cent. It’s a big WIN-WIN for YOU and THEM. We highly suggest to pre-purchase your trees if you want a wide selection. PICK UP will be from 8-10am, day of. Please fill out the form to pre-purchase. And again, if you want to donate but not plant them, we can do so in your honor. The trees and us will thank you. How to plant and care for your purchases!